WASHINGTON – When it comes to National Science Foundation (NSF) grants, historically Black colleges and universities (HBCUs) must step up their game to get more of the millions of STEM research dollars available to them. That was the message sent loud and clear at a two-day NSF Information Awareness and Capacity-Building Workshop that concluded Wednesday on the first day of the Congressional Black Caucus Foundation’s 48th Annual Legislative Conference. L. Rashawn Farrior speaks with symposium attendees. The evidence suggests that more are on the bench than in the game. Of the top 150 schools funded by the NSF, only two are HBCUs: Jackson State and North Carolina A&T universities, according to Farrior, a team lead in the Division of Grants & Agreements in NSF’s Office of Budget, Finance and Award Management. The difference between those two universities and HBCUs that aren’t among the top NSF grantees is simple, Farrior said. The QEM Research Action and Practice (RAP) Symposium’s overall goal was to help HBCU leaders understand how to apply for NSF research grants and why doing so will benefit their students, schools and the communities where they are located as they seek to build research capacity through collaborations with STEM advocates and practitioners. The event was co-hosted with Howard University’s Office of Research on Tuesday and the CBCF on Wednesday. 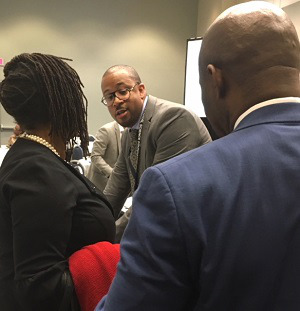 Farrior, an alumnus of Clark Atlanta and North Carolina A&T universities and a self-described “HBCU enthusiast,” spoke with candor and sometimes humor about how HBCUs can more effectively navigate the grant-procurement process and bring about a “paradigm shift” in their approach. · In applications, don’t out your school in a box by use of limiting buzz words and catch phrases such as minority serving institution an HBCU initiative. · Look for opportunity in areas of study and research that may not be most obvious for your institution, and not just in those areas where you feel most confident. · Understand the power of how investing in research and getting grants to do so can benefit your school, attracting new students which in turn brings in more tuition dollars to help build a stronger institution. · Follow instructions, submit application materials ahead of any deadlines and make sure you understand and adhere to every stipulation. · Invest in a full-time staff person devoted to seeking out, applying for, implementing and following up on grants to garner more of them. · Respond to and never ignore inquiries from the NSF, which is set up to provide expert assistance in helping schools understand the system, avoid mistakes that can cause delays in approval and prevent situations that could trigger an Office of Inspector General investigation. · “Make sure you’re actually spending the money” strictly where and how it was approved. · When a proposal is rejected, learn from it and keep trying. The NSF sponsors grant conferences, has proposal review panels on which representatives from participating schools can learn first-hand about proposal strengths and weaknesses and publishes a helpful proposal and award policies and procedures guide. In fiscal year 2017, Congress approved $17 million for the NSF to spend on grants for HBCUs. But much of it went unclaimed. For example, $2.1 million of that total was allocated to the geosciences sector, nearly three-fourths of which was left on the table, said Dr. M. Brandon Jones, program director for geosciences in NSF’s Office of Education and Diversity. In the opening plenary, Dr. Ivory A. Toldson, president of the Quality Education for Minorities Network (QEM), and Dr. Claudia Rankins of the National Science Foundation shared their philosophy of using HBCUS that have been successful in gaining NSF grants as models for other institutions. They highlighted strategies of developing relationships through building communities of researchers; identifying the best opportunities and taking advantage of them; deepening your understanding of the do’s and don’ts in the grant process; changing personal mindsets regarding perceived barriers and disadvantages; and change the institutional culture to place greater emphasis and value on research and its many benefits.